“Celebrating 40 glorious editions, the MidEast Watch & Jewellery Show will present a festive atmosphere and an exclusive jewellery showcase, which will catapult Expo Centre Sharjah into a focal point of the global jewellery industry,” assured a statement from organisers Expo Centre Sharjah. The event runs from April 5 to 9, 2016. “Visitors can expect to see an all-new show, right from scintillating ambience and elaborate decorations to live music, besides specially chosen gold and diamond jewellery from the best of the world’s leading chains and master craftsmen, said the statement. Ahead of celebrations marking the milestone edition of its flagship show, Expo Centre has unleashed an intensive promotional campaign, which includes a unique branding initiative with Air Arabia and special ad campaigns. “It is going to be a memorable experience and a landmark event for the global jewellery industry. We are embarking on a promotional drive which will ensure we are in constant contact with the customer. The drive includes the airline branding, a heavy online component, television, radio, print, events and other offline media,” said Saif Mohammed Al Midfa, CEO, Expo Centre Sharjah. Nearly 500 exhibitors from across the world including national pavilions will show up to present the region’s largest gold and jewellery showcase. The attractions include customisation and gifting options and prizes in daily raffle draws. Salem Al Shuaibi Jewellery will be displaying over 200 kg of gold jewellery at their stand. “Inside the halls, we will literally roll out the red carpet to exhibitors, visitors and industry representatives. Halls will be tastefully decorated while every stall in all the six halls of Expo Centre will sport unique designs that suit the occasion. There will be musicians playing live music to set the tone for the celebrations,” said Al Midfa. Literally taking the show to the skies, the Air Arabia branding deal will utilise every possible channel from the carrier’s livery to food trays, seatbacks, and in-flight magazines and videos. 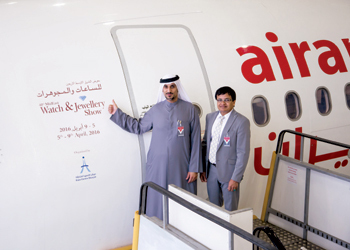 Nothing will be left out as Air Arabia leverages the show to make a pitch for customers. “Air Arabia, the region’s largest low cost carrier, flies to over 101 destinations across the Middle East, North Africa, Asia and Europe and the branding exercise will offer us a highly targeted captive audience, global reach and a high frequency of exposure,” said Al Midfa. “The show promotions can also be seen, read, liked and shared in social media, newspapers and general and niche magazines, radio spots and shopping malls, primarily focusing on use of online and offline tools to engage and excite consumers,” the organisers’ statement said. They listed some superlatives about the event: it is the longest running and most popular jewellery event, the only such event held twice a year and a 90 per cent exhibitor retention rate. On top of that the April event happens to be the 40th edition. Exhibition timings are 12 noon to 10 pm daily, except Friday, April 8 when it will be open from 4 pm to 10 pm. There will also be an exclusive ladies-only day, Wednesday April 6, when doors open from 12 noon to 4 pm. Admission is free for all.